Hi! We are Luke and Megumi. 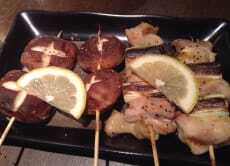 We live in Asakusa. Would you like to join us on for our Japanese cultural classes? We offer Japanese language and Japanese chess classes in our condominium. Have fun while learning new things with us! 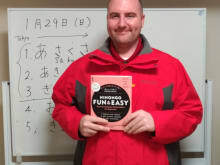 Take a Japanese Language Class for beginners in Asakusa! 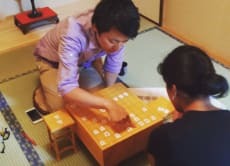 I had a great time learning Shogi at this experience. The host contacted me beforehand to get a measure on my ability and was able to work around this easily. We met nearby the location. Once there the lesson takes place in a traditional style room with tatame mats. After a bit of background we were into to practice games. During the games we were served with tea and rice crackers. It was a fun time and I hope to put what I learnt to good use soon. So much fun, Luke and Megumi met us and spoke with us in English. Luke explained the history and rules of shogi and then got us straight into practicing before we both played against him at the same time. It was a lot of fun and when we lost, Luke took us back through the game and got us to try to think of other strategies we could have used. A great introduction into the game of shogi. Lots of laughs and a great time!!! I have played chess before but never Shogi so this was a great chance to learn. My host gave me a wonderful introduction to the background of the game before moving onto the rules. After that we played through some set pieces and then some games. As well as being a great experience I feel I learnt more in my time (through his great explanation and coaching) than I would have in way.more time on my own or with someone else. Megumi is a great teacher and makes the session fun. In my case I didn't know any Japanese other than a few words so we focused on the basics: asking where things were, ordering food, introducing yourself, etc. I started using what I had learned immediately after leaving her class. I will definitely take another class with Megumi next time I'm in Tokyo. 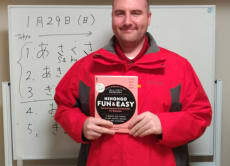 If you like language, are interested in Japanese culture, or just need some help getting around, this class is definitely worth it.